My name is Marilyn Wild and I have been with A Victorian Bride Hair and Makeup Design Team for six years as Linda’s key makeup artist. I attended Cosmix School of Makeup Artistry where I earned my degree in multi-media makeup artistry. 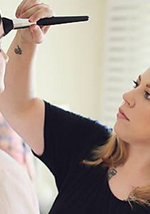 I specialize in wedding makeup, eyelash application and airbrush makeup. I look forward to working with you in your special day!